Our Practitioners are also committed to ongoing professional development continually updating their knowledge and skills through post-graduate education and evaluation of treatment. May 2013 The Shoulder Defined. # PDF Documents: The downloadable documents on this page are in Adobe PDF format. You need the FREE Adobe Reader to view these on your computer. Most computers already have this installed – if you cannot view the above documents you can download the Adobe Reader here for free. Physiotherapists, Osteopaths, Chiropractors and Podiatrists. Are you looking to join a company committed to maintaining the highest standards of professional practice for its clients? Would you like to work on a flexible self employed basis? If you are a healthcare professional committed to the same high standards of ethics and care as Physio Logic Ltd and who works well within an organisation, as well as providing an independent high standard of care to each patient, you would be an ideal candidate for our business. We have an established team of practitioners but we are always interested in committed healthcare professionals seeking to join the practice. Mrs Wendy Carswell, Physio Logic Ltd, 26 Westgate, Otley, West Yorkshire LS21 3AS. Experienced physiotherapists required to join our friendly team in our well-established, multidisciplinary private clinic. Must be enthusiastic, motivated and able to work both independently and as part of a team. Positions are flexible but would include evening and weekend work. Would suit person who would like to work initially on a flexible and as needed basis but with opportunities to increase as the need arises. 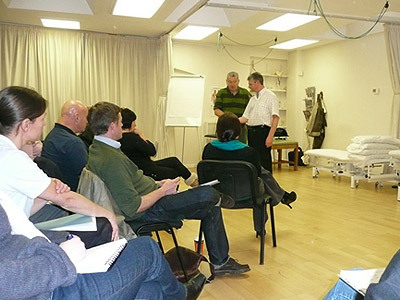 Are you looking to further your CPD by helping to organise courses and seminars at the practice? Would suit a person looking to work on a flexible basis who has good organisational skills. Ideal for a healthcare professional looking to add to their CPD through free places on courses held through Physio Logic Ltd.
Would require afternoon, evening and weekend work to be available to welcome delegates and courses lecturers and ensure smooth running of the presentations throughout the day. Experienced Osteopaths required to join our friendly team in our well-established, multidisciplinary private clinic. Positions are flexible and may include evening and weekend work. Experienced Chiropractors required to join our friendly team in this well-established, multidisciplinary private clinic. As Physio Logic Ltd currently has no chiropractor we would be looking for professionals willing to establish this part of the business. Experienced Podiatrists wishing to join our friendly team in our well-established, multidisciplinary private clinic. Position flexible but may include evening and weekend work. *Please read these Terms and Conditions if you are interested in any vacancy with Physio Logic Ltd.
Physio Logic Ltd prides itself on maintaining a high standard of professional healthcare and service where all clinicians are appropriately qualified, experienced and adhere to their relevant professional body’s code of conduct as well as abiding by Physio Logic’s policies and procedures. All personnel at Physio Logic are committed to the same high standards of ethics and care which Physio Logic requires and each person given an Associate position has been identified as someone who works well within an organisation as well as providing an independent high standard of care to each patient. On contacting Physio Logic Ltd you will be invited to fill in an application form available by email to print which should be sent back to Physio Logic Ltd as a hard copy along with a current CV. Following consideration of your application form you will be asked for interview if the need for your services has been identified. An Associate Agreement will be determined and dependent on your experience, satisfactory documentation, and success at interview and is awarded to those personnel who fulfil certain criteria. Where the Managing Director feels that there is a need for your expertise within the organisation. You are able to show the necessary qualifications in your profession with an original certificate or copy** to prove this. You are able to show membership of your relevant professional body and licence to practise, and enclose the relevant documents or certified copies** to prove this. You can show an adequate and appropriate length of experience in your profession. You are able to show an up-to-date CV. You are able to provide three satisfactory references. You are able to show evidence of a recent CRB check. An original HPC membership certificate or equivalent registration body and membership card where applicable. An original membership card showing membership of relevant professional body including full professional indemnity. A Contract and Form stating that you have read Physio Logic’s policies and procedures contained within its Personnel Manual and Health & Safety Manual which will form part of your agreement with Physio Logic Ltd. The use of these forms is seen as complementing existing good recruitment practice at Physio Logic Ltd, and as part of the overall selection and recruitment process. We hope you understand the necessity of the above criteria as Physio Logic seeks to ensure it maintains the highest standard of professional practice for its clients. ** Copies of certificates must be witnessed and signed by a person of professional standing declaring that they have known the applicant for over three years and must include a statement of this declaration, their signature, date, and printed name and address.